First make yourself a batch of cornbread. If you plan ahead, even better -- let it sit out overnight on the counter. If not, you can prep the other ingredients while it bakes. When it’s ready you can make the stuffing. Preheat oven to 350. Fry bacon in a large skillet over medium heat until crisp, 8 to 10 minutes. Transfer with a slotted spoon to a large bowl. Increase heat to medium high and add butter to bacon fat in skillet, then add onions and celery and saute until golden, 6 to 8 minutes. Add apples, pecans, thyme and sage and cook until apples soften, 3 to 5 minutes. Transfer to bowl with bacon. Add corn bread, cayenne, stock and salt and pepper and toss well. Place the pork on the cutting board with the ribs sticking straight up and the meat on the right. Use a long thin and very sharp knife, and cut along the right side of the ribs, (leaving a litle meat) until you get 3/4 of the way down the loin. Don’t detach the ribs! Then turn your knife to the right and “unroll” the loin into a wide slab. When you’re done, you should have a flat piece of pork with some ribs sticking up. Place the stuffing on the pork, then roll twoard the ribs. Tie it with kitchen twice, and if you feel more comfortable, close it with some toothpicks. Transfer to a roasting pan and roast until internal temperature reaches 135, about 50 to 60 minutes. 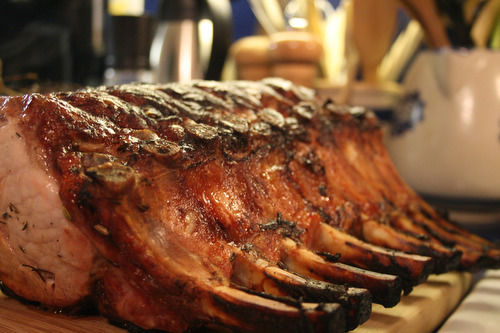 Loosely cover with foil and set aside to rest for 15 minutes before carving.